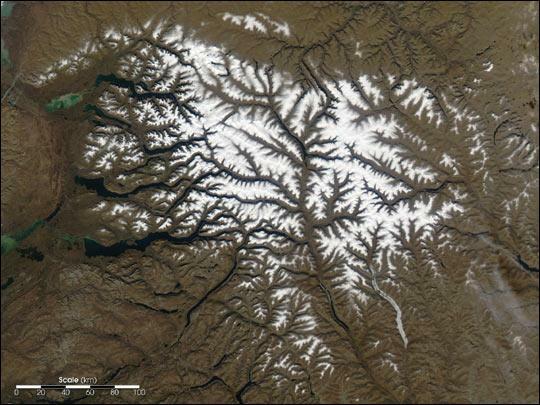 The Putorana Plateau in northeastern Siberia. Credit: Jeff Schmaltz, NASA/MODIS. Basalt lava two kilometers deep is said to have come from a “mantle plume” eruption. 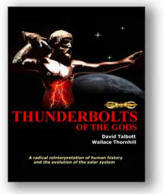 Could it be another sign of planetary electrical discharge? In a previous Thunderbolts Picture of the Day, one of the largest astroblems on Earth, Popigai Crater, was described as a scar that was created by electricity blasting the terrain in multi-trillion-watt arcs of cosmic fire. Indeed, rather than meteorite impact sites, the majority of large craters are most likely electrical in origin rather than the result of kinetic shock. The word “trap” is from the Swedish for “stairs”. Thus, the Siberian Traps are a stepped feature – meaning that the terrain does not rise and fall in a gradual slope but is uplifted in gigantic blocks that resemble a staircase rising toward the north. As we have previously written, similar geologic structures are found elsewhere. Some cover thousands of square kilometers with anomalous terrain, erratic boulders, glassified spherules of stone, Lichtenberg trackways and many other chaotic signatures of electrical activity. According to conventional geologic theories, the Siberian Traps are the remains of volcanic eruptions that took place at the end of the Permian Age, around 250 million years ago. Scientists consider it to be the largest volcanic event on Earth in the last half-billion years. The amount of lava released during the theorized million-year time period is truly staggering – an area two million square kilometers (five-times larger than Texas) in extent is covered with basalt deposits two kilometers deep. A so-called “mantle plume” has been suggested as the method by which magma melted the crust and then erupted through the Siberian Craton. Mantle plumes are thought to rise from the core-mantle boundary roughly 3000 kilometers beneath the surface of the Earth. They are presumed to be gigantic convection cells, cycling heat from the core and providing the energy that drives plate tectonics, allowing continental movement over the thinner crust. Some geophysicists object to the theory, however. Under Siberia is the old Archaean structure. From the Greek word arche (“beginning” or “first”), standard theory says the Archaean era is the “primal” era on Earth. It began four billion years ago and lasted for 1.5-billion years. It is “primal” because it was then that small continental landmasses began to form. Later, the “microcontinents” began to coalesce into the large formations that we see today. Our article entitled “The Expanding Earth Debate” took issue with some of these ideas because there are too many presumptions in the mantle plume theory. First, no known mechanism has ever been proposed for the melting of the crust due to phase changes in the mantle. How did the mantle acquire the excess heat? Second, the Archaean rock is too thick for a plume to heat it enough to melt it into magma and force it to the surface. The geochemistry of the basalts in the area is also inconsistent with the theoretical process. Third, there is no evidence of uplift in the sedimentary rocks – a characteristic that should be expected from a mantle plume’s expansion. So, what did happen in Siberia? The great explosion in 1908 that flattened millions of trees is the record of a tiny episode in Siberia’s history, although it could be that the detonation was the result of an electric arc jumping from a charged object entering the field of Earth’s giant capacitor. Popigai crater is another example of lightning-type excavations, except Popigai is 100-kilometers in diameter and lies on the edge of the Siberian Traps near the city of Norilsk. One interesting technical point is that the area surrounding Norilsk produces one-fifth of all the world’s nickel. Nickel is often associated with presupposed meteor impacts, although the origin of the high concentrations within them is not known. It seems likely that northern Siberia was the location of lightning strikes as big as half a continent that might have occurred in relatively recent times. The incredible power of those strikes excavated billions of tons of material and redistributed it all over the world – glass spherules from Popigai are found as far away as Great Britain. The arcs uplifted the Putorana Plateau and carved its summit with Lichtenberg figures, as well as leaving semi-circular mountain ridges composed of basalt that march out from the center for hundreds of kilometers. Unusual geomagnetic anomalies are found all over the region – an unmistakable sign of electric currents flowing through the strata.